Hold your horses! Hide the children! What you are about to see is food rated “R” at its best! 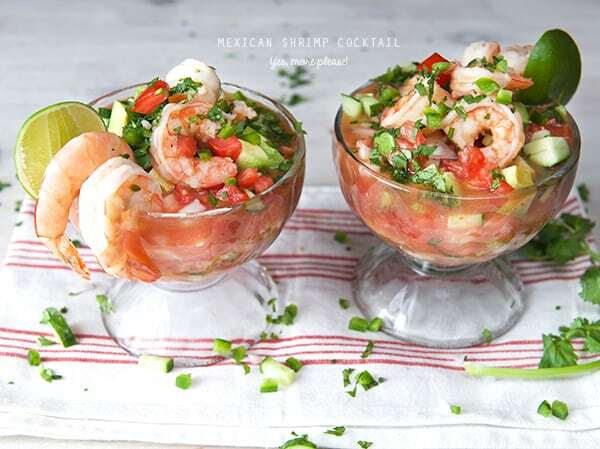 My Mexican Shrimp Cocktail is to die for. 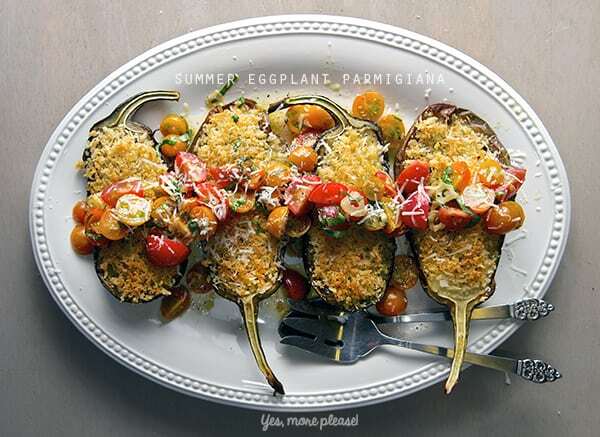 Fresh, delicious, and savory; it’s the perfect simple light meal for a hot summer afternoon. This juicy cold and light savory cocktail is a meal in itself. What makes it Mexican style? Well the whole combination of vegetables, accoutrement, and the cold broth. It’s a savory broth made with shrimp shells and seasoned with fresh orange and lime juice, ketchup, and some dashes of hot sauce. 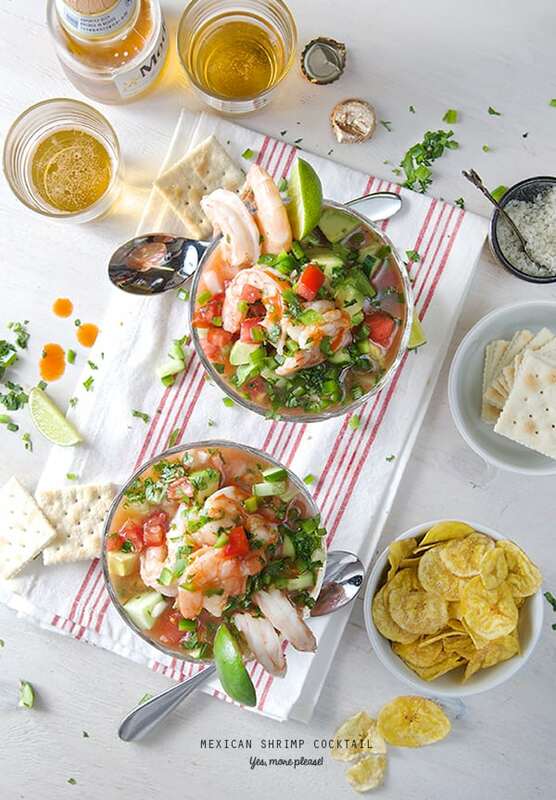 The result is this light fresh savory broth that goes incredibly well with the shrimp. 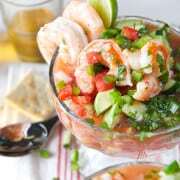 In my opinion there’s no need to buy those bottled clam juices when you can get the most natural flavor out of your shrimp! There are many variations in which more than one shellfish is added to this concoction. Common ingredients include octopus, clams, oysters, baby scallops. 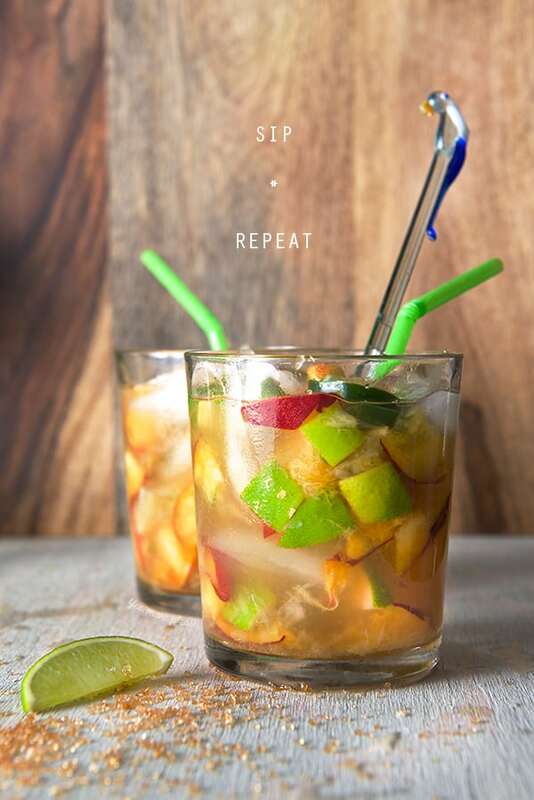 It is called “Vuelve a la vida” which translates to “come back to life” because its invigorating attributes. That, I can not guarantee, however I assure you that it will refresh and invigorate you on a summer afternoon. In my case, I just love the simplicity of flavors and the way the shrimp skins cooked as a base produce a magic broth with depth and character! Prepare this dreamy cocktail for yourself ! You can make it in advance, since it is served cold on chilled glasses. 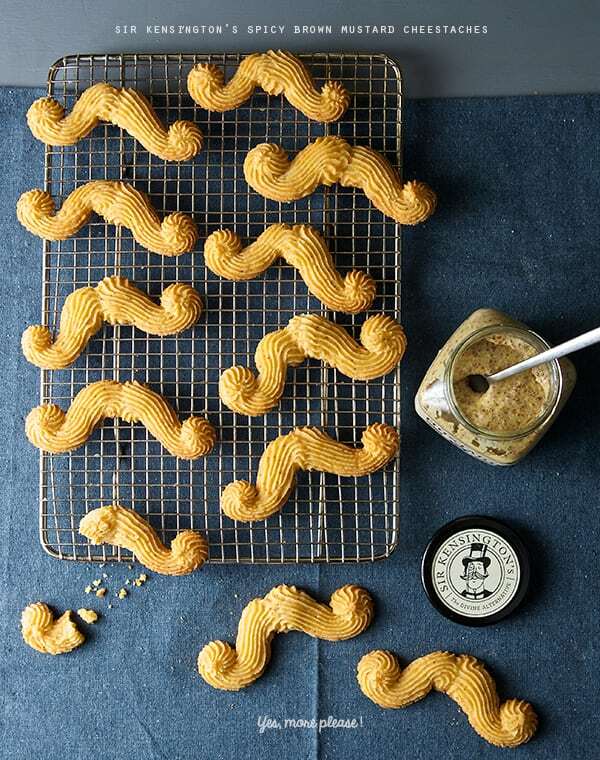 For parties you can serve it with all the vegetable accoutrement on the side which allows your guests to customize their own. Keep it ice-cold at all times. 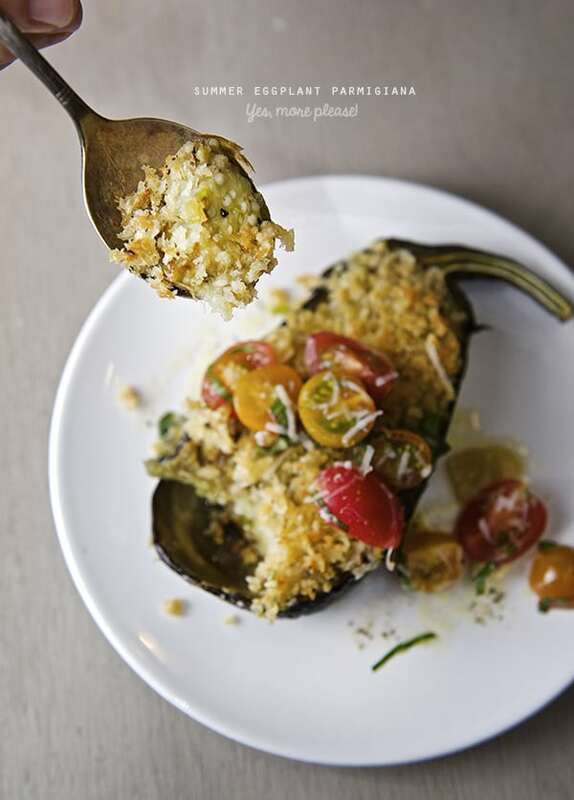 It is truly a great summer crowd pleaser. Enjoy! 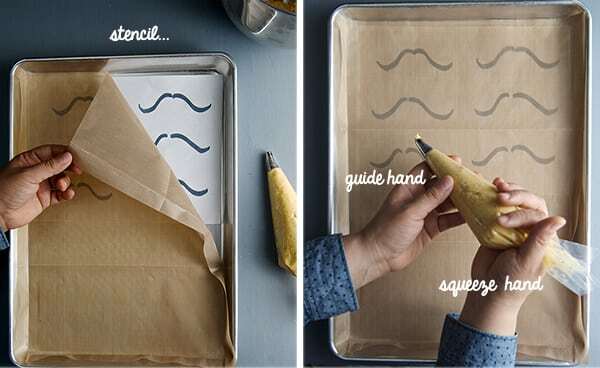 I can assure you this recipe will be part of your repertoire for many years to come. 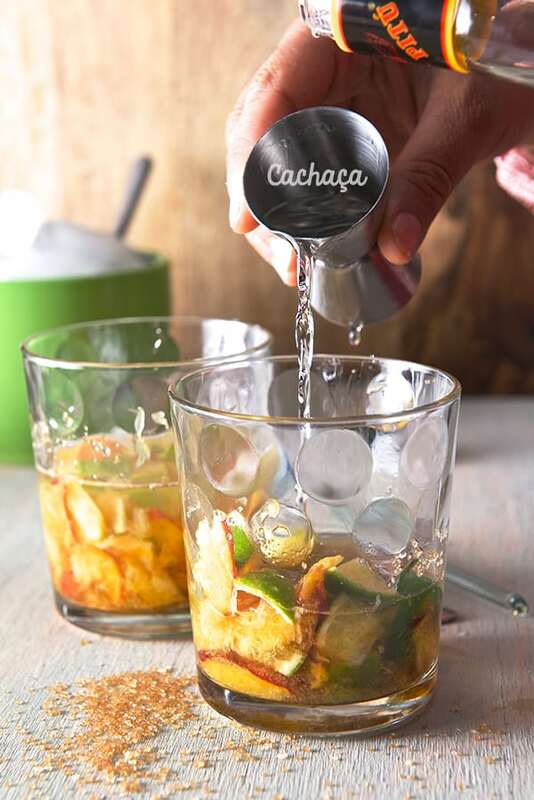 This cocktail is light and refreshing, it can serve two as a meal or four to six as an appetizer. 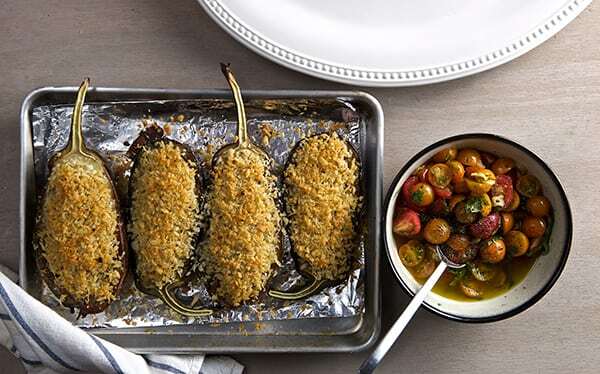 This recipe can easily be doubled or tripled upon family size, or a friendly party crowd. 1 – ½ lbs. 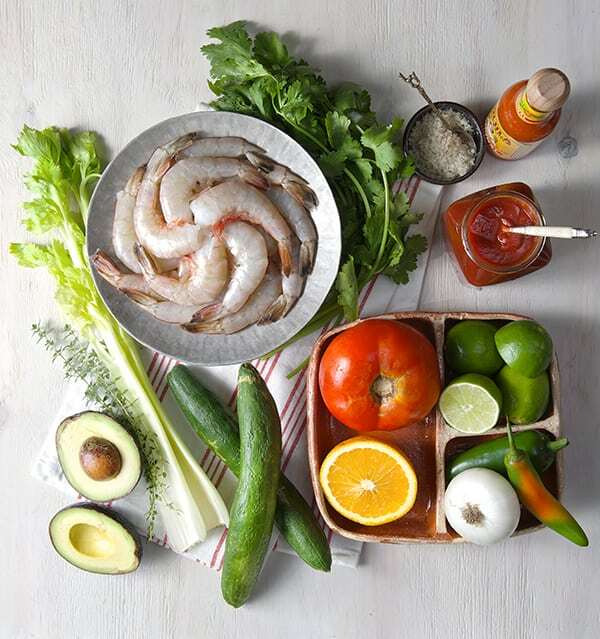 Jumbo or medium large shrimp, peeled save the skins and deveined. The reserved skins from the shrimp. ¼ wedge of a white onion. 3 large limes + 1 or 2 more to garnish. A few dashes of your favorite Mexican Bottled Hot Sauce, I prefer Cholula, Valentina or Huichol. 1 medium cucumber seedless such as jade or English cucumber, small diced. 1 chile Serrano or Jalapeno with seeds. 2. 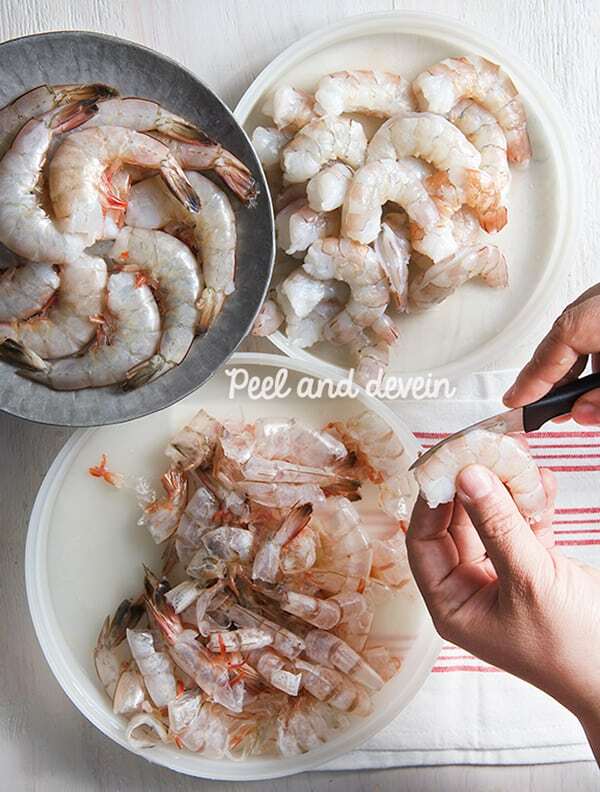 Peel and de-vein the shrimp, reserve the skins and leave 4-6 unpeeled, tail-on shrimp for garnish. 3. 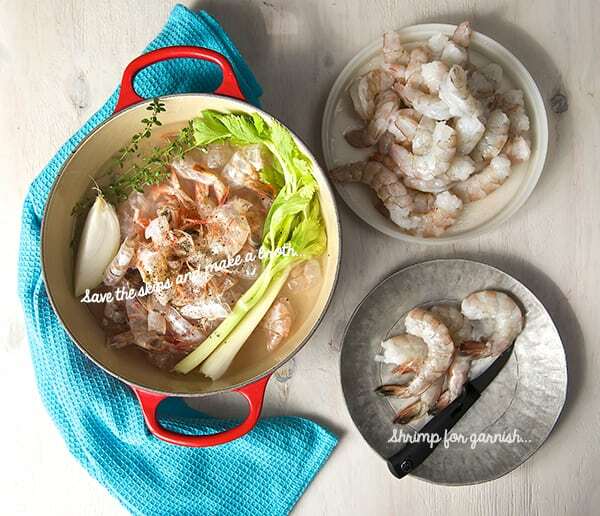 In a non-reactive pan place the shrimp skins, along with the celery stalks, onion wedge, thyme, a pinch of sea salt and some cracked black pepper. Add 3 cups of water and simmer for about 15- 20 minutes. 4. 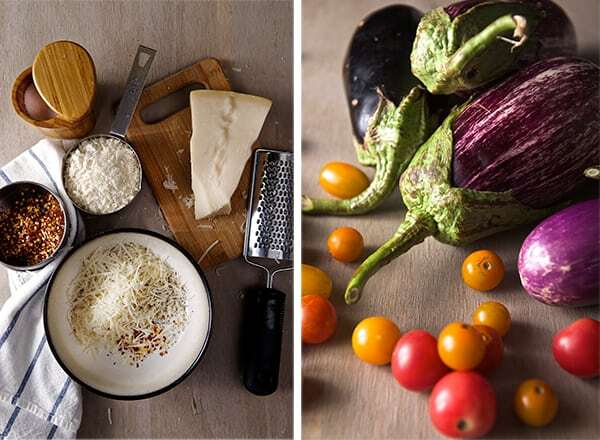 Meantime, prepare all your vegetable accoutrement. 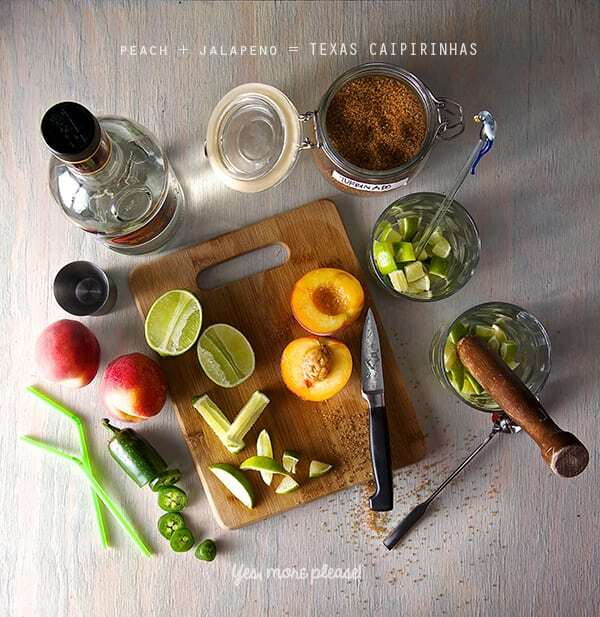 Dice and chop the tomato, cucumber, onion, serrano or jalapeno peppers, limes, avocado and cilantro. Set aside. 6. 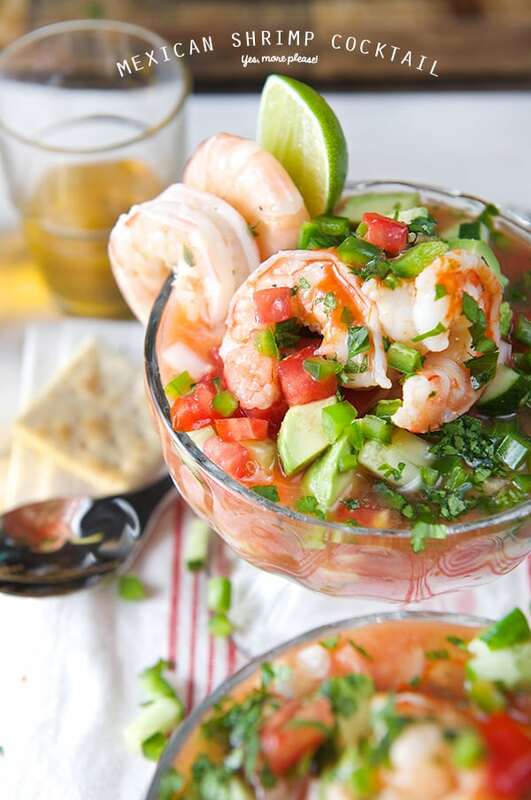 With a slotted spoon, pull out the shrimp a little before you think they are ready. They will keep cooking with their residual heat. Place the shrimp on a plate with ice underneath. (see picture below). 7. Fill a bowl halfway with ice and place a metal or glass bowl on top of the ice. Place a fine sieve on top of the bowl and drain the broth. With a wooden spoon, start whisking to cool off the broth until the temperature of the broth feels fresh and cooler. 8. You should have around 2 to 2-1/2 cups of broth left, transfer the broth into a liquid measuring cup if you have more than 2 ½ cups discard the extra broth. 9. Start seasoning the broth. Squeeze the juice of 3 limes, the juice of 1 small Valencia Orange, add Ketchup (I used my favorite: Sir Kensington’s spicy ketchup!) 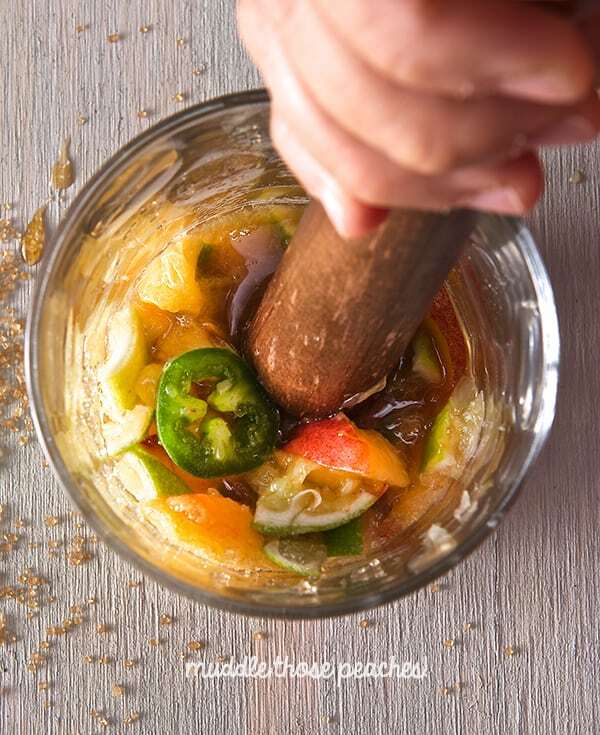 add a couple of dashes of hot sauce, the sea salt, and whisk. 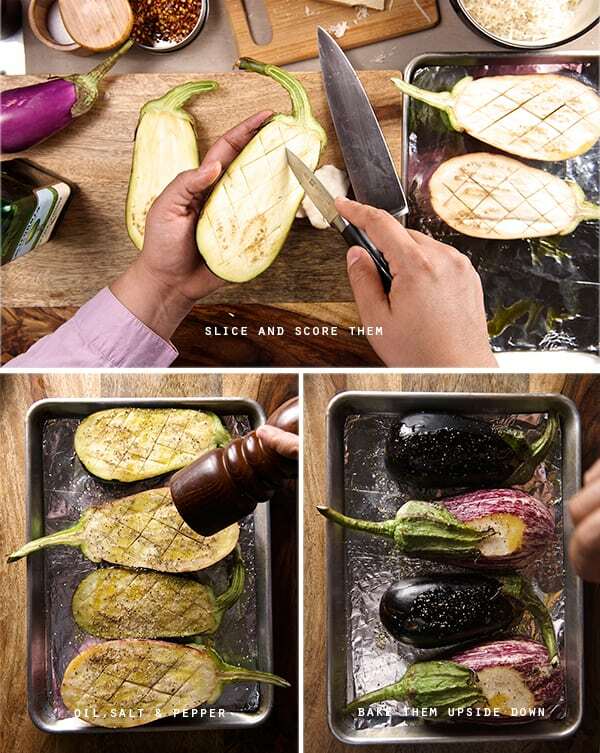 Taste and adjust flavor for salt or pepper. 10. 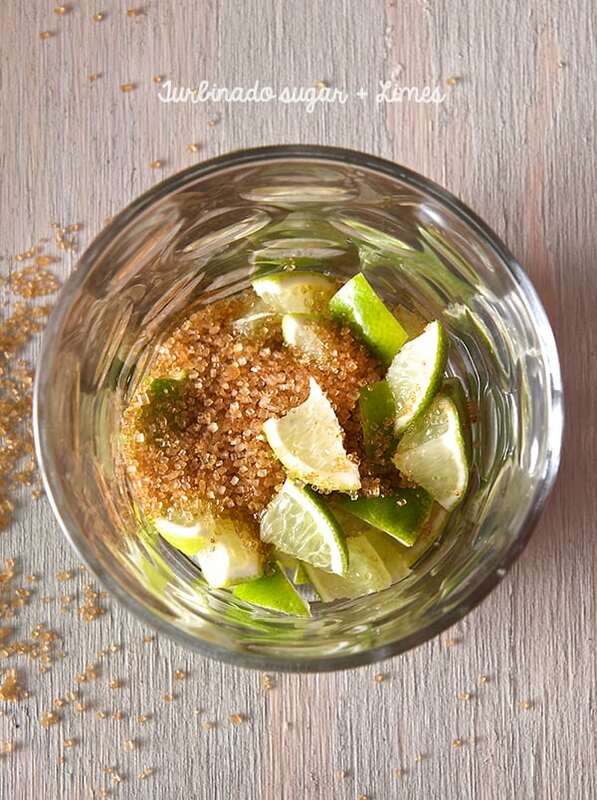 Pull out the frozen glass serving bowls and start arranging your cocktail. Start by layering the ingredients and add the seasoned broth at the end. No rules here! You can add as much or as little veggies as you want. Avocado is a must, highly necessary!, A little extra squeeze of lime juice, sprinkle some cilantro and an extra dash of hot sauce…Prepare for the stampede!.. you are gonna love it. Enjoy! 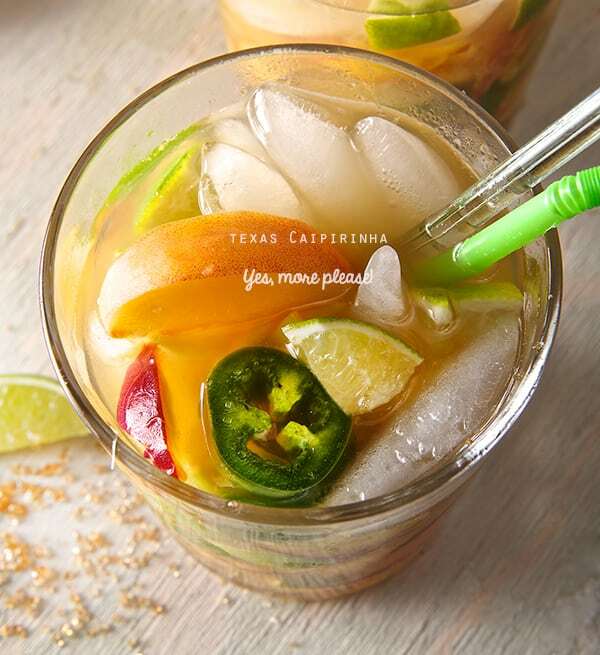 Refreshing, light this Mexican cocktail its perfect for a pool party or a weekend of leisure at home. remember to have a very very cold beer, Ceveza bien fria! Enjoy! 1/4 wedge of a white onion. 3 large limes, plus 1 or 2 more to garnish. 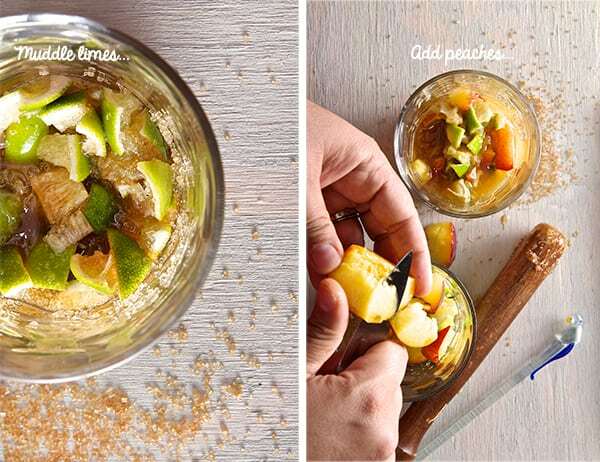 Pull out the frozen glass serving bowls and start arranging your cocktail. Start by layering the ingredients and add the seasoned broth at the end. No rules here! You can add as much or as little veggies as you want. Avocado is a must, highly necessary!, A little extra squeeze of lime juice, sprinkle some cilantro and an extra dash of hot sauce…Prepare for the stampede!.. you are gonna love it. Enjoy! Tomato Season in full bloom, but we have to move quick because here in Austin, July is the end of it. These red jewels do not handle triple digit temperatures. 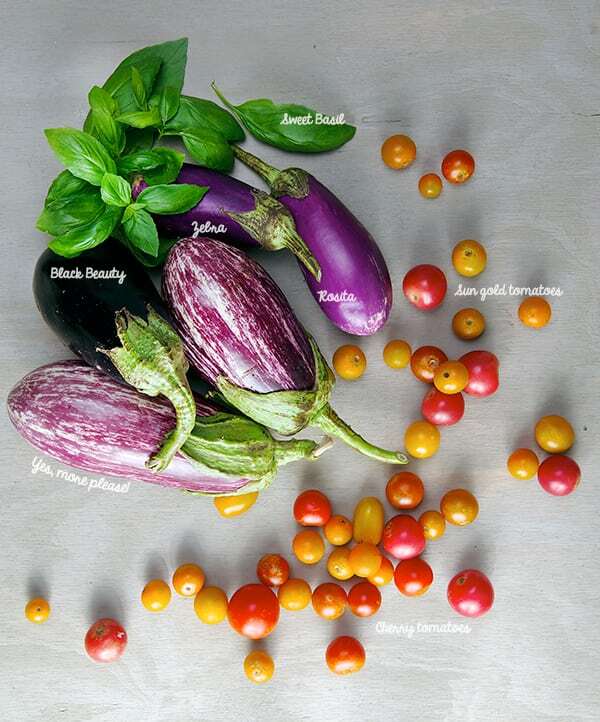 We have been eating them faster than I can come up with recipes to share; adding them to omelets, frittatas, salads, or as simple as slicing them with a bit of lemon juice and sea salt. Yes, I love them that much! I’m in tomato season heaven. So the search for tomato inspiration involved going through my cookbooks. 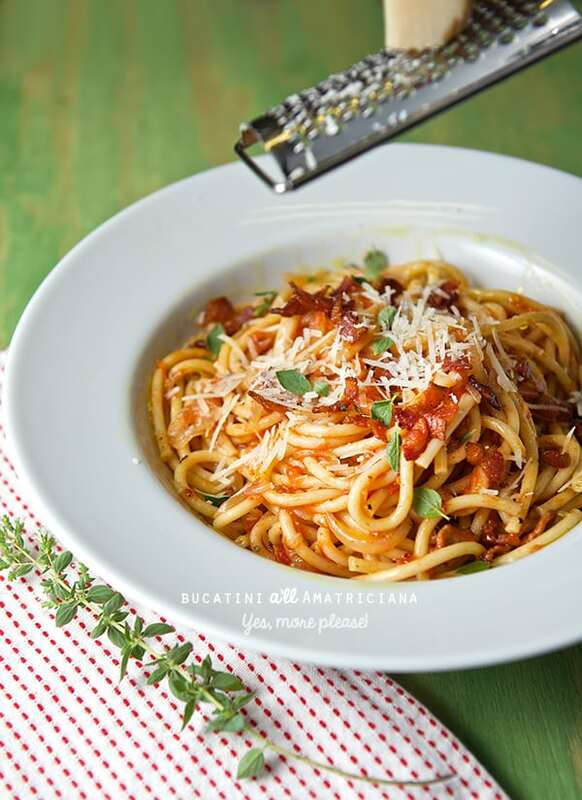 In search of a classic tomato recipe I ran into this pasta recipe that is very dear to my heart, Bucatini a’ll Amatriciana. The first time we had this Roman classic, the way Italians intended, was in Rome. We spend almost one whole day at the Vatican Galleries walking and absorbing every single piece of art from the loooong corridors, from sculptures, tapestries, paintings, murals, jewels, did I say sculptures, murals, paintings? We finished the day at the Sistine Chapel, and Saint Pietro. Oh, my! we had an Art binge that day. After more than 6 hours, trapped and surrounded by the most amazing pieces of art and history we grew a voracious appetite. We felt like liberated lions in the Coliseum! Our stomachs were growling, we were in ‘art coma’. Hungry, thirsty and desperate, we noticed that we were surrounded by religious and souvenir stores…but we wanted food!!! We walked and walked the narrow Roman streets, searching for a non touristy dinner… And suddenly we were lost. Oh no, that was not good at all! Hunger does not let you think and makes you disoriented. We were getting grouchy and tired. But as you know there is no harm that lasts a hundred years. Suddenly we saw a place with a big sign that said “Forno a Legna”, the most incredible arousing smell coming out of the door and a young man with a great smile (and the word buffalo mozzarella pizza). We felt like we had found the oasis on the desert, hypnotized and in a state of art coma, we sat down and this great polite man received us. We just told him “We need food; you feed us.” We had Caprese Buffalo Mozzarella Salad, Wood Fired Pizza Capricciosa, a Green Salad and we trusted him to bring us his favorite pasta. When food arrived to the table it was incredible, everything looked and smelled so good, except for the pasta which did not looked very promising. At first sight it looked like “that famous Italian chef canned pasta” were the tomato sauce is kind of scattered and looked a bit under sauced. The noodles where very thick and they had sprinkled it with copious amounts of Pecorino Romano. I thought he was pulling a tourist pasta on us… I was so hungry that we did not care at that point. To our big surprise the first bite of that pasta was a revelation. I felt like the whole Vatican art collection pasted a slide show in my head. That pasta was the best pasta I’ve ever had. 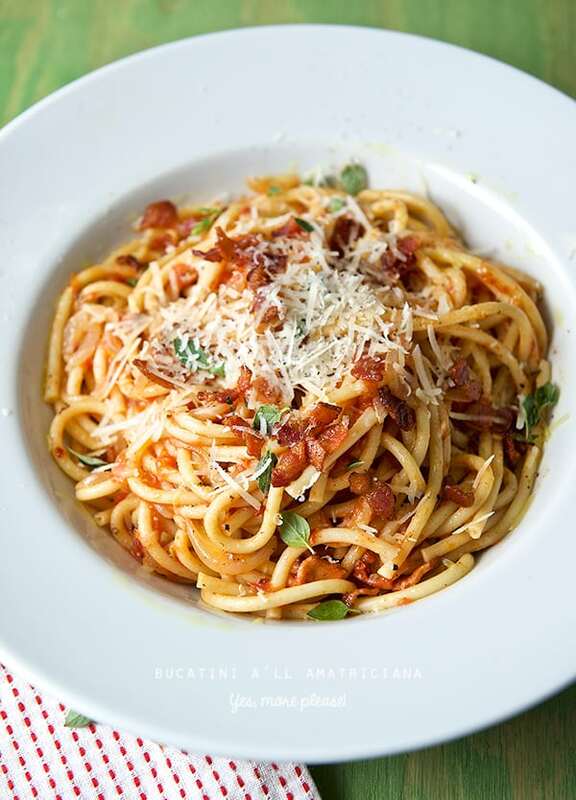 Bucatini a’ll Amatriciana. Ian and I looked at each other incredulous of this amazing feast, we kept eating and making sounds of extremely joy and comfort. When we finished, all sort of questions were bombarding my head. This was by far the best pasta we ever had. Perfectly cooked, this thick spaghetti-looking pasta had a hole in the middle that was filled with all the juices from the sauce. The most luscious, salty and tomatoey sauce I ever had. And as we ate it we tasted the occasional piece of rendered guanciale, a cured meat. The Pecorino Romano added a perfect texture, and the pasta was silky and had the perfect balance of utterly delicious tomato flavor. This pasta would be best described as an Aria to tomato flavor. At the end of our dinner, Ian and I just looked at each other amazed by what we just had eaten. I wanted to know everything about this pasta. I called the young man and he introduced himself. 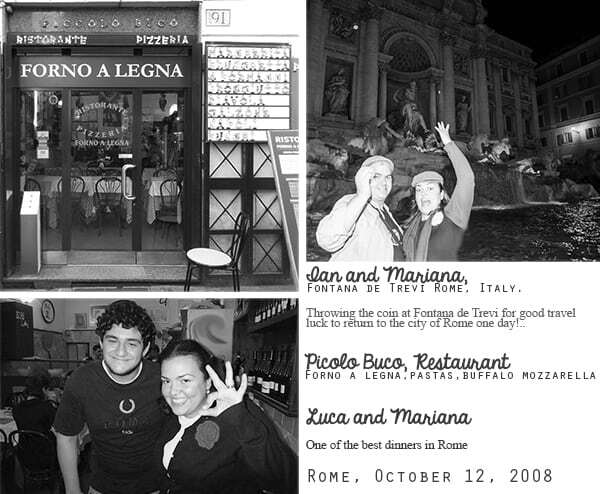 His name was Luca and he was the son of the owner of the restaurant. Like in most cases this restaurant was family owned. 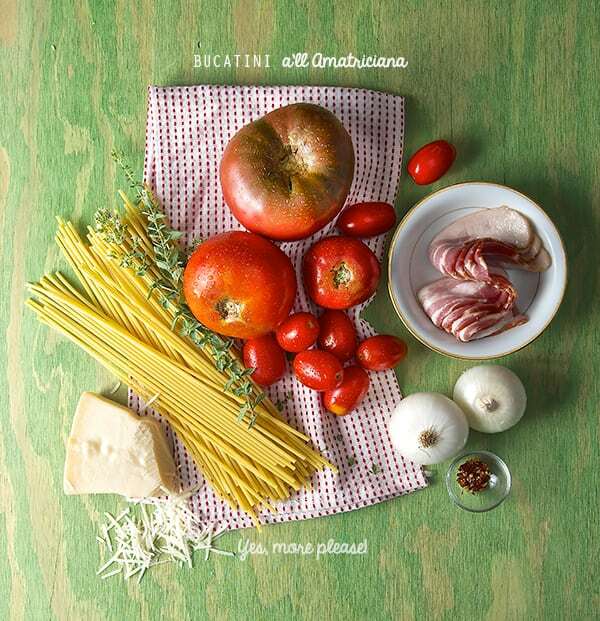 Luca told us all about the pasta; Bucatini a’ll Amatriciana, his favorite pasta. He described the preparation and the ingredients. 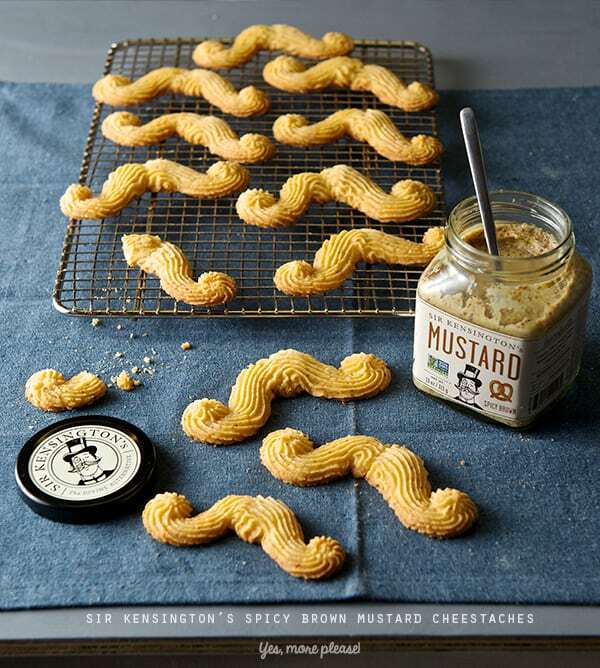 I was in awe of the fact that there where just four ingredients. This conversation brought me full understanding of the importance of pasta-sauce ratio, the importance of pasta shape and sauce type relationship, best pasta conversation of my life!. We will always be grateful of Luca to have shared his pasta wisdom with us, to had been such a great hostess and to have enlightened us with this amazing experience. 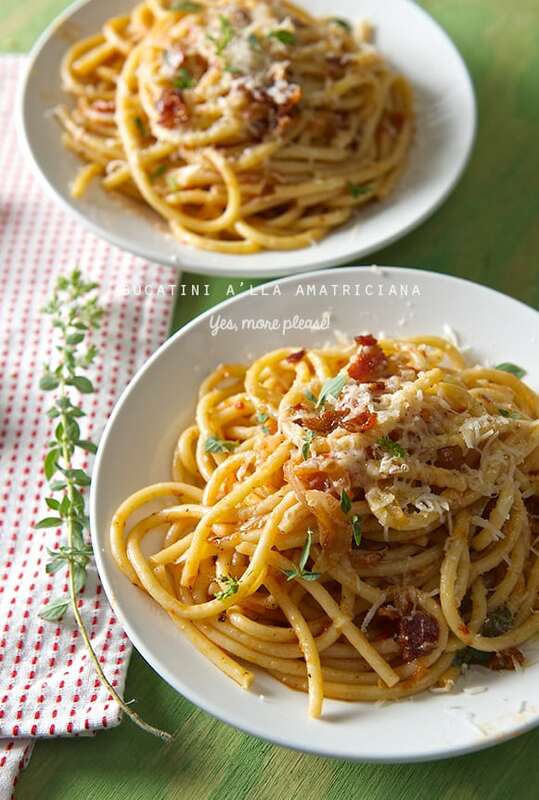 This Bucatini a’ll Amatriciana brings us lots of great memories and what a best season to make this recipe than tomato season. Please Enjoy! Serves 4 or 2 hungry, lost souls. 1 lb. bucatini pasta, I used Rustichella d’Abruzzo, De Cecco, Del Verde, Garofalo, Barilla will be all good options. 4 slices of thick not smoked-cured bacon or pancetta or guanciale, diced. Best option of the tree: Guanciale. I used Bacon that was what I had available. 1 lb. fresh ripe tomatoes, I used a combination of heirloom and red plum tomatoes, San Marzano will be idyllic, I just wanted to use what is in season and it turned out fantastic! 1 small or half a white sweet onion, thinly sliced or diced. 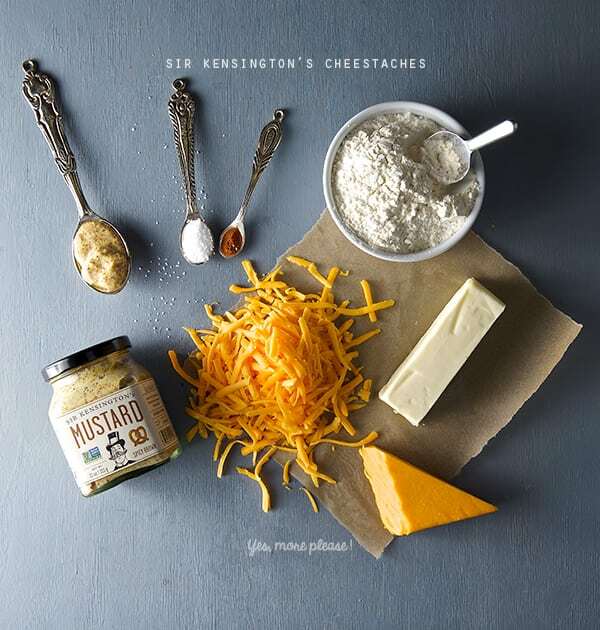 ½ cup of freshly grated Pecorino Romano. 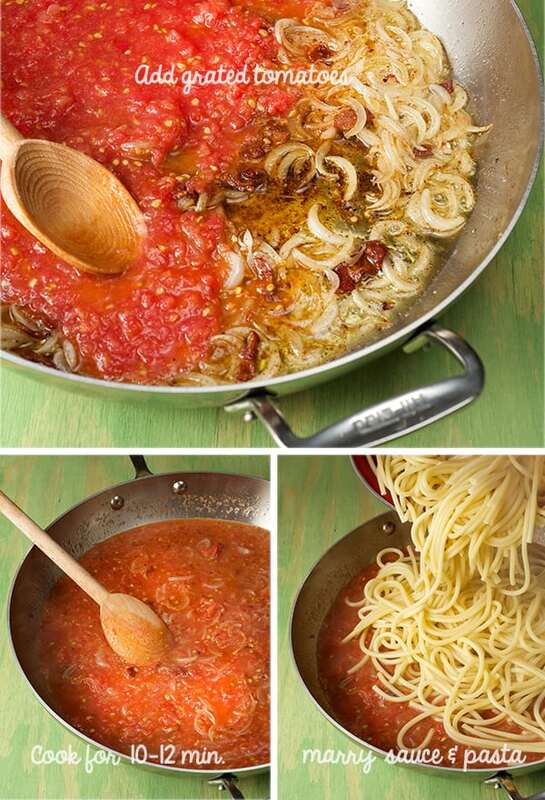 Italians traditionally make Amatriciana sauce with Guanciale, salt-cured pork jowl. It is similar to pancetta, but not as lean, and therefore has a richer flavor. Pancetta is the second option and a little more meaty. The third option is cured / NON-smoked bacon. I used the bacon of a well-known organic brand that makes a great cured/non-smoked delicious and leaner bacon. 1. 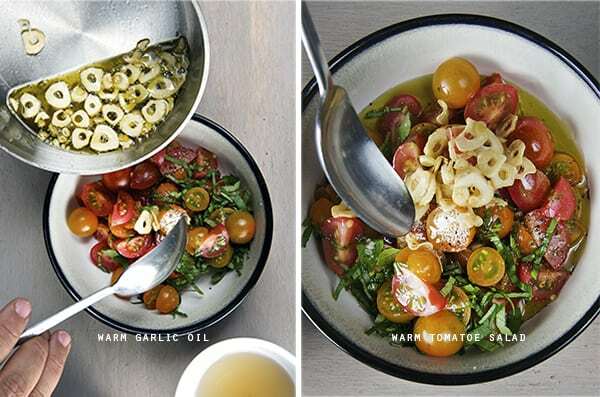 In a large pot, start by heating up your pasta water and a couple of good sea salt pinches. 2. 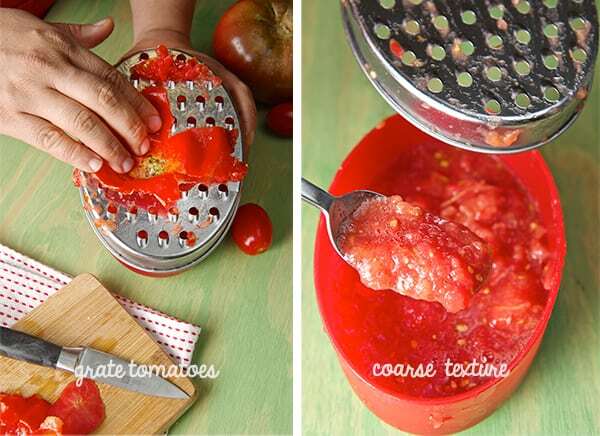 Mean time, with the help of a cheese grater, grate your tomatoes, omitting the skins. 3. 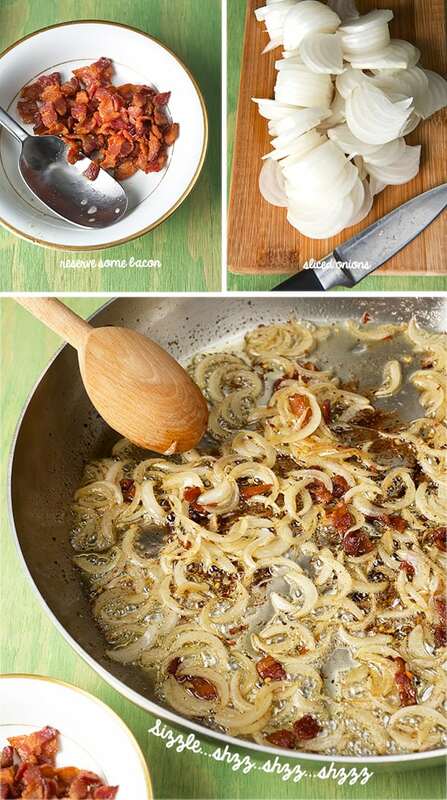 Cut your onions and Bacon. 4. In a non-reactive heavy bottom pan or a stainless steel pan add half of your olive oil and cook your bacon, pancetta or guanciale until crispy. 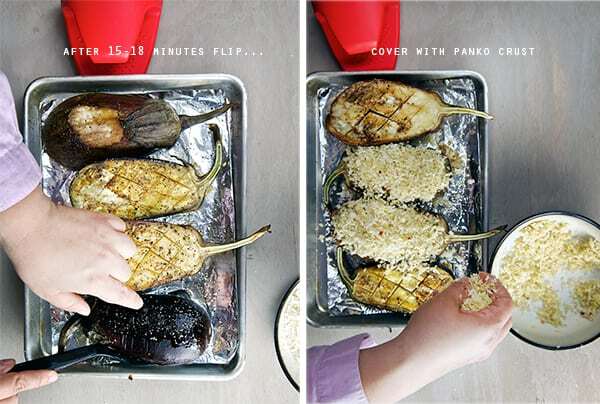 Remove half of the crispy bits and add the onions. 6. 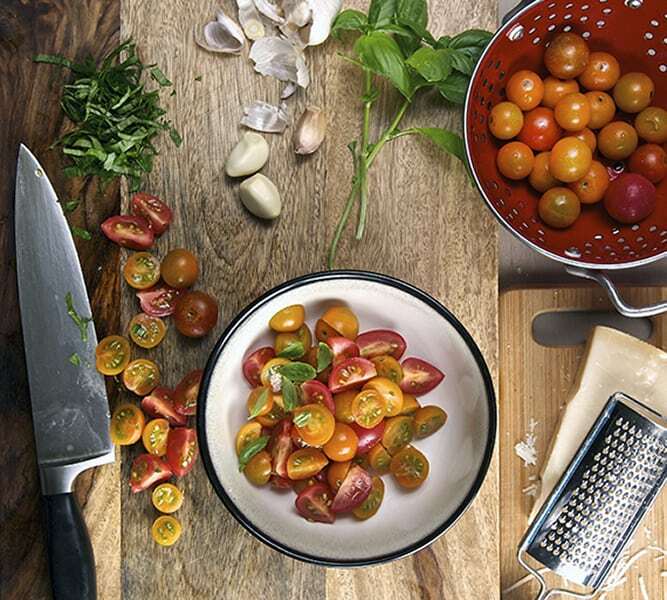 Add your grated tomatoes, oregano sprig and cook for the same amount of time that it will take to cook your pasta. 7. 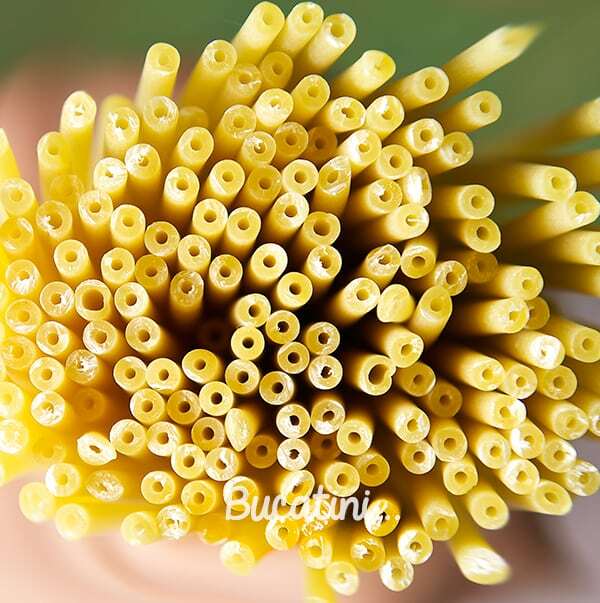 Add your pasta to the boiling water and cook following the directions on the package to be ardent approximately 6-7 minutes or other wise. 8. 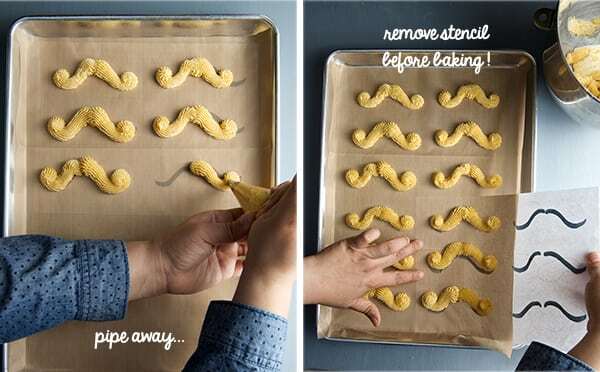 Reserve some pasta water. Drain your pasta, and add the pasta to the sauce, add some pasta water if needed, add the rest of the oil and reserved bacon, adjust seasoning. 10. 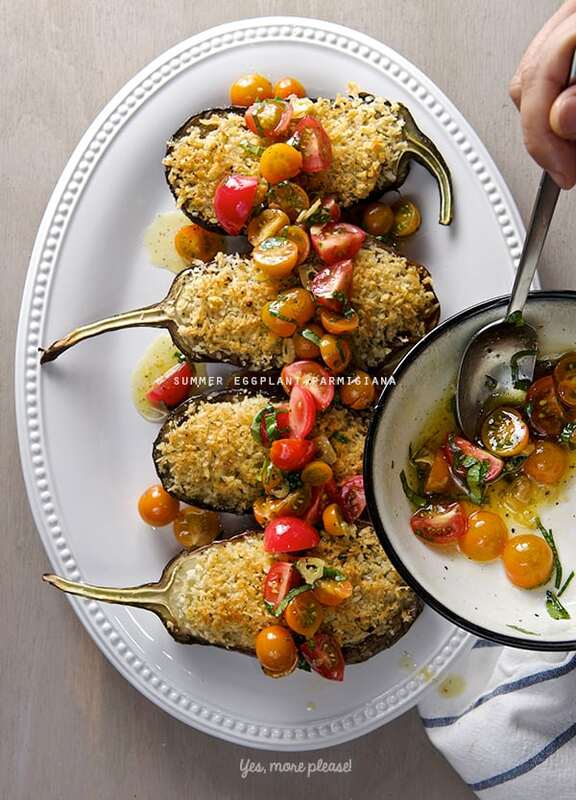 Serve immediately and sprinkle with generous amounts of grated pecorino Romano. *Sprinkle some fresh oregano leaves if desired…Roman people will kill me I know…but it tastes so good!